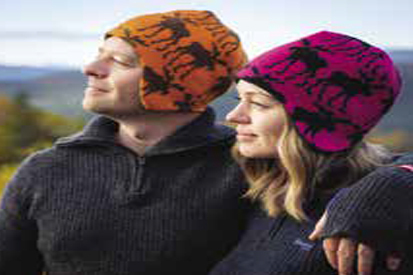 Near the Polar Circle, beneath the northern lights or the midnight sun, the people at Polarull design, sew and knit beautiful and practical wool products as well as providing career opportunities to those who need it. The result? Beautiful skirts, ponchos, hats and more, all made of high-quality wool. The people at Polarull do everything themselves: the designing, the knitting, and the sewing, and all the wool they use is Norwegian. They also sell wool capes that go with the traditional clothing from Nordland, northern Norway. Complementing the winter clothes, Mosling had the idea to let the Middle Ages inspire women’s clothing, which turned into her design of Eddadrakten, with a feminine touch. All the products can be found in their workshop in Mo i Rana, and they recently opened up a web shop so that people from all over the world can buy their products. It is in English and customers can pay in euros. They also ship worldwide. “I think what’s so great with our products is that not only do you buy quality wool products handmade in Norway; you also play a part in providing people with special needs new career opportunities,” Mosling smiles.